Premier League chief executive Richard Scudamore has defended claims from Newcastle manager Kevin Keegan that the dominance of the top four is "boring." Keegan made the claims after his side's 2-0 defeat to Chelsea on Sunday. 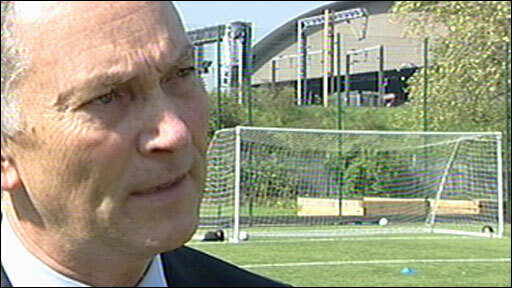 "I don't think anyone in their right mind seriously thinks it is boring," said Scudamore. "I'm not saying he's going to regret what he has said but on reflection the word boring is probably not what Kevin really meant." He added: "The reality is that there is no-one who is interested in football who thinks the Premier League is boring. I don't believe it for one minute. It's about time a manager came in and spoke the truth! Every word he said was true! "Why is it the most watched? The numbers tell you it is the most exciting league in the world." Keegan said after Sunday's game: "This league is in danger of becoming one of the most boring but great leagues in the world." But Scudamore thinks that the 2007/08 season has been far from boring. "It is Kevin, we know Kevin and we love him, he is fantastic," said Scudamore. "His great quality is that he wears his heart on his sleeve and that is his great strength and that is why we love him. "But I think he's just gone through the heat of battle, he's just competed very, very well for 60 minutes, he thought he had a chance of winning the game and all of sudden they've lost 2-0 and then a microphone goes under his nose and he says that. "I don't think it is necessarily boring but it is a challenge for him to get Newcastle from where they are now into the top four and I don't necessarily think that is boring and is one he will attack with vigour and passion." Scudamore also defended the theory that the title race is too predictable and that the Premier League was just about the top four. He said: "There are a lot of different tussles that go on in the Premier League depending on whether you're at the top, in the middle or at the bottom that make it interesting. "In simple terms two of the three promoted clubs normally stay up so it is not necessarily the case that the promoted teams go down. "You just have to look at statistics which say that while it is hard to get in the Premier League and stay in the Premier League that does not necessarily make it boring." Is Premier League world's best? Does the world want Premier League?